When Brian Moorhead retired from his job as an engineering technologist at the University of British Columbia in 2002, he spent the first year enjoying every minute of retirement. An avid mountain climber with a love for the outdoors, eventually the 78-year-old realized there’s only so much fishing he can do and so many days to climb mountains. So Moorhead got involved with the local climbing association – the Squamish Access Society, forging a new path as a volunteer trail builder, mentor and public parks advocate. 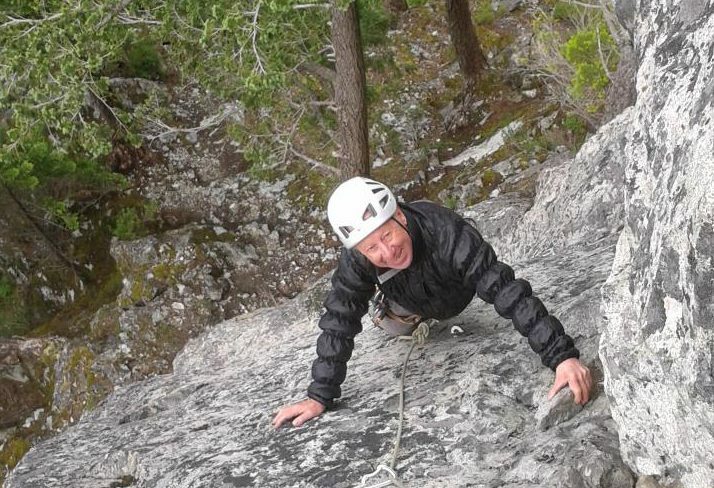 “It’s always been important for me that the public enjoys the resources we (climbers) enjoy, but they don’t have to climb the vertical trail,” said Moorhead, who started volunteering as chair for Smoke Bluffs Park in Squamish, developing a network of trails there over eight years. Then someone suggested he build a loop trail system in Murrin Provincial Park, connecting climbing resources that would also create a nice hike for non-climbers. It didn’t take much convincing for Moorhead to jump on board and take the lead. With support from the board, volunteer organizations, BC Parks staff and university students from outdoor rec programs, Moorhead’s crew hit the trail with pick axes and shovels in hand. According to Moorhead, a crew can complete 50 metres of trail on a typical day. Contractors are hired for the hardest tasks such as moving large heavy rocks. Located 9 km south of Squamish on Highway 99, the 1.8-km Murrin Loop Trail opened to the public in September 2014, providing stunning views of Howe Sound and access to six world-class rock climbing sites. The parking lot at the trail head is often packed before 10 a.m. Moorhead can’t help but feel proud. “I’m fairly proud of the work I did at the university, but six months after I built or designed something it was obsolete with technology changing all the time. When you build a trail system and you see people from all over the world enjoying it, it’s hugely satisfying,” said Moorhead, who’s now spearheaded four major projects with BC Parks in the last decade – Murrin Loop Trail, the Murrin Loop Trail Jurassic Park extension, Baseline Trail and Malamute Trail. In addition to developing the popular trails, Moorhead also regularly organizes and works with various volunteer groups to maintain and patrol the trails, and instill a love of natural areas – something he developed as a young child growing up along the coast of Northern Ireland. Moorhead continues to wear a variety of hats and recently received a 2017 BC Parks Volunteer Award for his ongoing care of provincial parks. He’s always planning more work to bring trails in parks to a higher standard. For more information about Murrin Provincial Park, click here.